Wish I'd have known about this. Where was it Ev? I thought they said they were doing a gig in Denver, but he did say he might have got it wrong,but it was on their site, It was a great night and I did get some video of a couple or three songs ( and a bit of Roy Williamson but you cannot win em all!!!! sorry Roy,it was great. Great night of nostalia last night at Downham. The Strollers put on a great show. Had a nice meal with R. Meek and some of the other old musso's this week and very nice it was too. Would love one of those wigs. What was the line up of the Hitch-Hikers? THat was great that you found this, wonderful times, I went to the first Shane Fenton night at the Corn Exchange, cannot remember who backed the boys from Mansfield but it was a fabulous ( remember everything was fab then ) night, the Fentones were absoloutely fantastic, what live music is all about, it will always be in memory that night, I got the autographs of the band on my Tech student union card! Shane Fenton is no longer with us but I think the rest of the Fentones are still around. When I saw then the drummer was Tony Hinchcliffe, I think he left and went to South Africa. 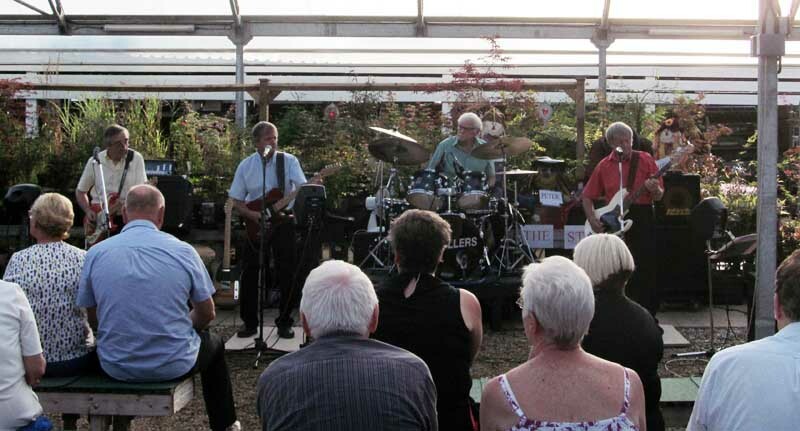 Bill Bonny was in Canada last I heard ( bass player ), Mick Eyre still around Mansfield area ( rhythym guitar ) and Gerry Wilcox I have a feeling is living in Devon now, something tells me near Dawlish not sure why. Great band, great bunch of lads and if any of the local bands came into contact with them you would know what I mean. 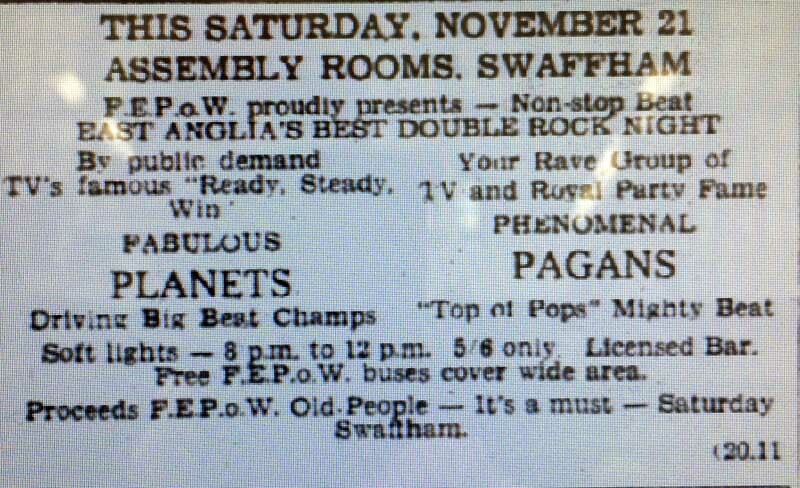 Nigel told me that he thought the Offbeats had supported them 35 times, wow they must have been great nights. 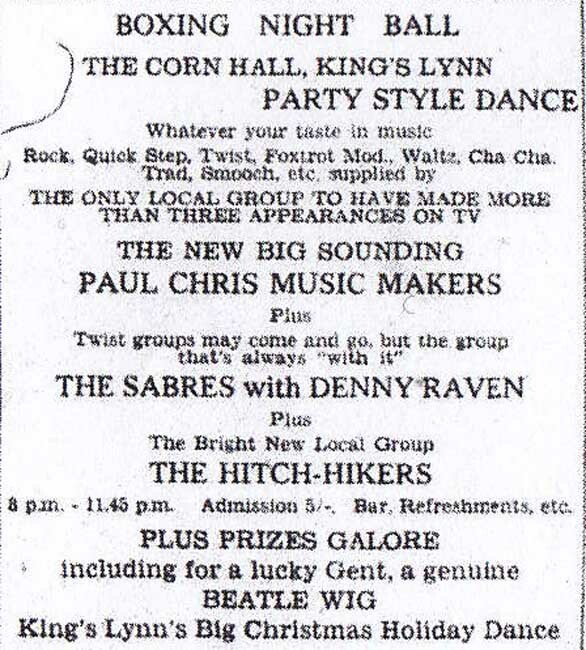 I wonder what the attendance record was for Shane Fenton and the Fentones, for sure with todays Health and Safety thingys it will never be beaten, any offers EWW? 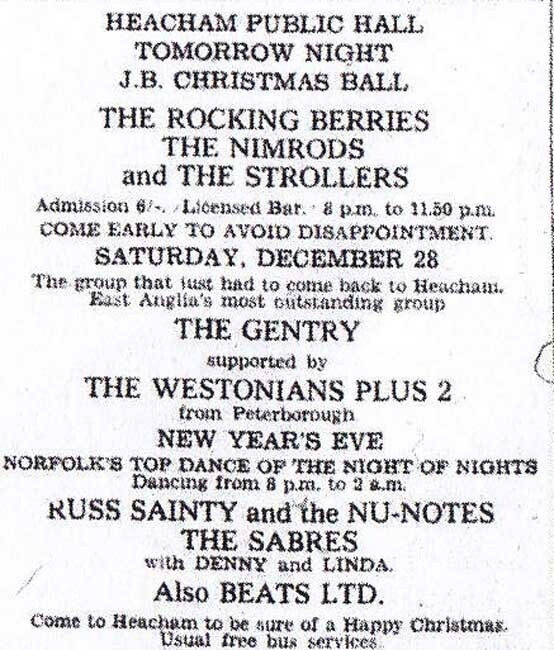 I also see the Gentry mentioned as well in late 64, I remember seeing them in early January performing live in the open air in the square in the middle of Peterborough. My fingers were cold so what it must have been like for them you can imagine, the good thing is that it was not snowing or raining. 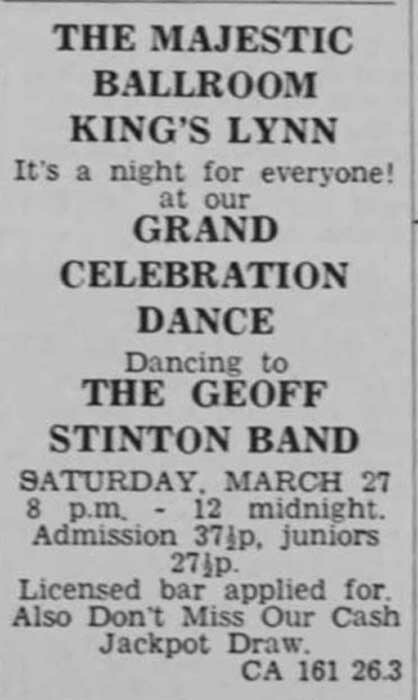 Found a cutting from the very early days of Geoffs band. Look at the ticket prices.